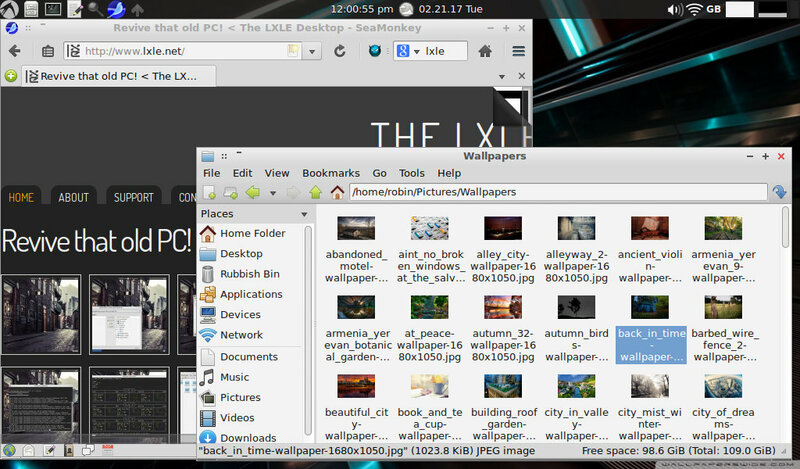 LXLE is an easy-to-use, lightweight desktop Linux distribution based on Lubuntu; an Ubuntu re-spin using the LXDE desktop environment, it is aimed at reviving or extending the life of ageing computers. It follows the same LTS schedule as Ubuntu to ensure stability, as well as hardware and software support. The current release, LXLE 16.04.1 "Eclectica" was published July, 2016, and when you look at the installed set of software, 'eclectica' is an apt description of this Lubuntu re-spin. Finally unpacking in the new house, my old JVC Mini-note resurfaced over the holidays, but the last attempt to revive it with Lubuntu had broken down somewhere along the line. 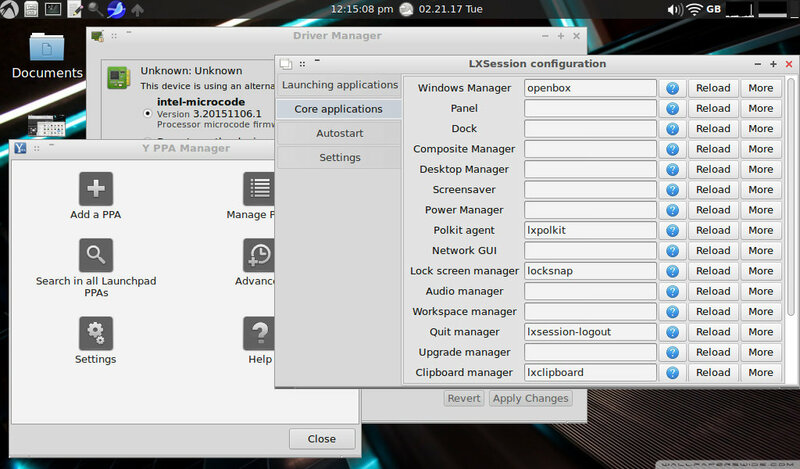 Looking around at the lightweight Linux distros currently on offer, LXLE bobbed up to the top of the list. The Ubuntu/Lubuntu base is in my comfort zone and the system requirements fitted within the JVC's 1GB RAM and Centrino processor's capabilities. In the re-spin world, there's 'lightweight' and there's 'lightweight'. LXLE is somewhere in the middle of the scale; the 1.3GB ISO installer image comfortably between the minimalist Puppy Linux, the now defunct Crunchbang and the heavier official Lubuntu, Arch or Debian (my regular Linux OS). Both 32 and 64 bit OS versions are available, depending on your hardware. On older 32-bit machines like mine you may need to adjust the install options to force the memory extension flags for PAE (add: forcepae -- forcepae). The installer itself follows an established pattern; it is very stripped down with no custom options past the locale, keyboard and partitioning choices. Take the quoted 7-9 minute install time with a pinch of salt; my first attempt, erasing the existing Lubuntu and replacing with LXLE crashed out after twenty-odd minutes with a complete fail. Not to be put off, I tried again and let the installer reformat the partition and start from scratch. Twenty-five faultless minutes later and LXLE declared itself ready. There's no messing with graphics or Wifi drivers - if you have standard hardware, the Ubuntu driver base takes care of that. The JVC display hasn't looked this good in years and the wifi only needed the encryption key and it was online and running. It is an extraordinarily full collection for a lightweight distro, from Libre Office to the Mozilla-based SeaMonkey browser, Transmission, Guaydeque media player with codecs, Flash player (yeuk!) and even the Openshot video editor. I wouldn't say that's a wise default choice, but it displays confidence and ambition. Just look down the program docs page on the LXLE wiki: the usual accessories include the Pluma text editor, there's an education category, a host of games, a ridiculously well-stocked graphics section (PDF Document Viewer, Font Manager, Gimp, LibreOffice Draw, Mirage, PhotoPrint, Scribus (LS), Shotwell, Simple Image Reducer, SimpleScan); Gnucash, Planner, Homebank and more in the Office section alongside the full Libre Office suite; under media you get the player, codecs, video editor and then Audacity, Xfburn, Simple Screen Recorder and more; there's really very little you can't do out of the box, with a modest 6GB installed base. And remember this is aimed at older machines. If that's not enough, you get access to more software via Lubuntu Software Center and Synaptic and the Y PPA Manager and the GDebi package installer. If you look at the LXLE project team's stated goals, I can definitely go along with the statements "based on Lubuntu Linux to ensure a fast capable desktop for aging computers" and "stays with Ubuntu at the core of the system to ensure plentiful support options" for which LXLE scores full marks, enabling the third goal -"keeps desktop and other major software updated to the latest stable version." So far so good. I will take issue with "a modern-looking, intuitive desktop - for anyone to use easily" and "provides a complete drop in and go replacement for XP, Vista, 7 Starter/Basic." Come off it. It's Linux; it's OpenBox. Those two things betray its' roots and it's no Linux Mint MATE or Cinnamon desktop that you can dress up in Windows' clothing. Moreover, I don't believe any desktop is intuitive; Windows, Mac or Android - just give one of those to your technophobe grandmother and see how far she gets. OpenBox is a branch line within a desktop paradigm that harks back to Xerox Parc in the 1960's; desktops are only 'intuitive' once you've learned the concepts they're based on. If it's so intuitive, I'd be able to find the settings for the screen locker that does a weird 8-bit blur with no instructions. And I've been playing this game for twenty years or so. I will say that LXLE's desktop does render smartly using the updated Openbox, reliable PCmanfm file manager, OpenJDK, Fast Forecast, Aero Snap, and Quick Launch, and has a stunning set of wallpaper art. You can also say that it indeed "covers most users everyday needs" by providing an excellent set of default apps. LXLE has stable and solid performance once it's running, although I'd say the promoted boot to online time of 15 - 60 seconds (very dependant on hardware) is still optimistic. Support looks to be good; besides the project homepage as a first-stop resource, there is a project wiki with good documentation, useful LXLE OS Forums hosting the usual Q&A threads which I've made use of, an LXLE OS IRC thread on freenode that I haven't tried yet, and the LXLE OS mailing list which I've joined. Good grief, not only did you pick an older version of LXLE to 'review' you also included software that was not apart of the default OS selection. Things like Scribus, GNUCash and Planner were part of business 'LS' version, but hey, who needs good, informative articles right? It was the current version when I got it from the official site.